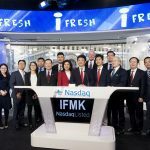 iFresh, Inc. (NASDAQ:IFMK）To celebrate her tenth anniversary, Boston iFresh Supermarket-Chinatown, Boston is going to send out gifts, gifts and gifts! (Reported from Boston) iFresh Supermarket-Chinatown, Boston under iFresh, Inc. (NASDAQ:IFMK) has recently started an event to celebrate her tenth anniversary, Which will last a month so as to repay the support and love of our customers. With a number of chain supermarkets set up all over America, the headquarters of iFresh, Inc. (NASDAQ:IFMK）is based in New York City. Currently, iFresh Supermarket-Chinatown, Boston located at Chinatown in Boston sells about 200,000 – 300,000 kinds of commodities. The available variety changes with the season, including Asian and American goods. iFresh Supermarket-Chinatown, Boston is one of the biggest Chinese supermarkets in the Boston area. As compared with other supermarkets in the same industry, our goods are fine in quality and low in price while we maintain the highest level of service. What’s more important is, our specialized management team puts the interests of our customers in the first place and to make our customers feel satisfied is our highest guiding principle. In order to celebrate her tenth anniversary, starting on March 31, iFresh Supermarket-Chinatown, Boston will hold a one-month-long event to celebrate her tenth anniversary. It will not only bring to old and new customers more than a hundred kinds of fresh vegetables and fruit as well as articles of daily use at special prices, but also organize a gift-sending event: “A Gift Sent on Each Purchase”. During the event, if only any customer makes a purchase, he or she will be given such sweet gifts as Thailand Five Elephants brand fragrant rice, Taste of Gold brand olive oil, South Korea semi-dry, semi-wet squid and purchase vouchers of the supermarket. Let’s celebrate the tenth anniversary of Boston No.1 together with you.